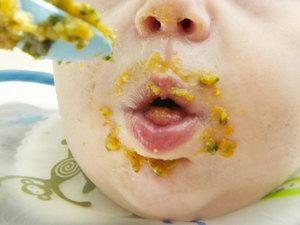 Did you feed your baby solid food way too early? When my first child was born, my aunt, ( who knew everything), insisted that I feed my infant some rice cereal so that she would sleep through the night. She insisted my baby was hungry all the time. While that may have been true, I knew better. But never the less I succumbed to the stupor of being a new mom and tried feeding my newborn a few spoonfuls of cereal to encourage a longer night’s sleep. Aren’t all new moms sleep deprived? Even though I was formula feeding, my husband did not do the middle of the night feedings since he had to get up for work the next morning so I was desperate when it came to some long stretches of sleep and I thought perhaps my aunt was right. Well, needless to say my dear aunt was not correct and my efforts to feed a “newborn” were frustrating, time consuming and fruitless when it came to lengthening my baby’s sleep time. Mind you, she was a good sleeper by all measurements, I simply wanted to rush her to sleep through the night. After a few days of attempting solids, I gave up and went back to nothing but formula for the next 6 months. She slept through the night when she was ready at 8 weeks of age. From the statistics, this practice is done by moms that are still influenced by their moms and grand moms. It is an erroneous practice handed down from generation to generation and it probably will not soon end because simply, moms and grand moms are more influential in some cultures than baby’s pediatrician. After all would your mom steer you wrong? 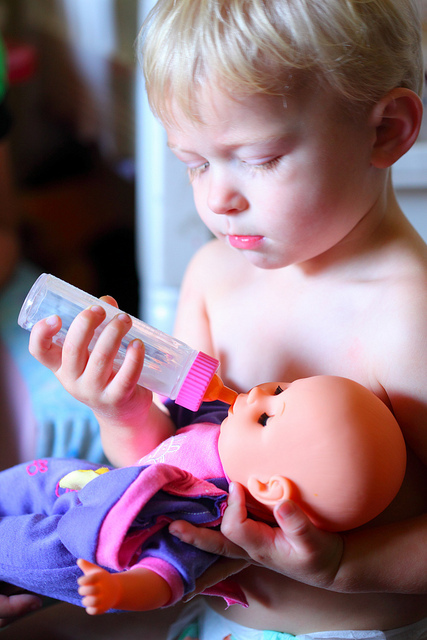 While many pediatricians are sympathetic to the difficulties parents face feeding their child nothing but breast milk or formula for six months, they say little good can come from feeding solid food to a child before he or she is physically ready. “When a baby is ready to start eating food, he will put his hands in his mouth, and you will see him actually making chewing motions,” said Dr. T J Gold, a pediatrician with Tribeca Pediatrics in Brooklyn. “At 2, 3 months, they can’t even hold their heads up well, and they can’t sit,” making it difficult, if not dangerous, to put solid food in their mouths. They also have yet to develop the proper gut bacteria that allow them to process solid food safely, potentially leading to gastroenteritis and diarrhea, Dr. Gold said. The early introduction of solid foods has also been linked to increased risk of obesity, diabetes, eczema and celiac disease. Many Babies Fed Solid Food Too Soon, C.D.C. Finds – NYTimes.com. This entry was posted in Ages and Stages, Feeding, Infant nutrition, Kids, Moms & Dads, Parenting and tagged feeding baby, Infant nutrition by llpitlwp. Bookmark the permalink.